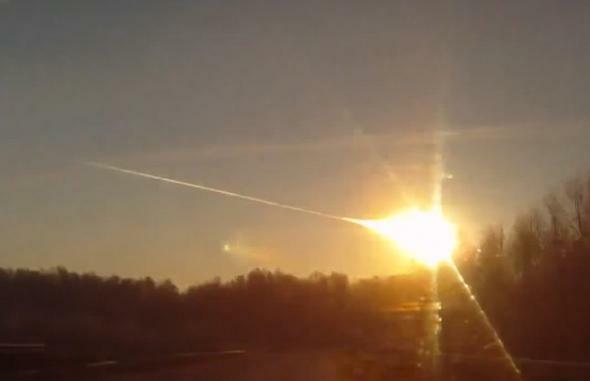 Chelyabinsk asteroid impact: One year later. At about 9 p.m. MT a year ago, I was sitting at my desk wrapping up a long day of writing. I was about to get up to watch some TV when I saw a tweet come in saying something innocuous enough, like “Have you seen this?” with a link to YouTube. It was a video from a Russian commuter’s dashboard camera, and showed a streak of light sailing across the sky leaving a huge smoke trail behind it. At first I thought it was a hoax; many such videos are. Then I saw another one pop up on YouTube, and another … and then the videos of the shock wave came in, and I knew I was in for a long night. But not as long as the people who live in Chelyabinsk. While this event was a boon to science, it was a chilling reminder that we need to be more aware of what’s going on in the Universe around us, and should the need arise, we must be ready to act. The huge vapor trail left behind by 12,000 tons of interplanetary detritus. 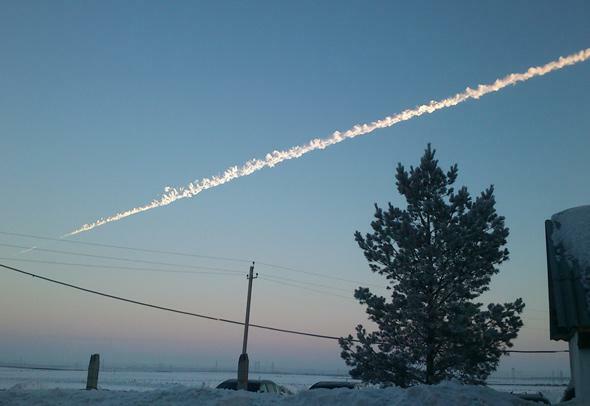 One year ago today, the citizens of the city of Chelyabinsk, Russia, had a bad day. In the early hours of Feb. 15, 2013, a small rock, probably 19 meters (60 feet) in diameter, was gliding silently through space … but a blue-green world lay directly in its path. Moving at a speed of 20 kilometers per second—45,000 miles per hour, two dozen times faster than a rifle bullet—the asteroid entered Earth’s atmosphere at 03:20 UTC (11:20 Eastern). After billions of years orbiting the Sun, its demise took mere seconds. As it plunged through our air, the pressure built up tremendously. It compressed the air in front of it, heating it up enough to cause the surface of the asteroid to begin to melt and blow away. Seconds later the pressure had increased so much that the rock began to crumble as surely and suddenly as if it were hit with a massive hammer. The rock violently shattered into a dozen smaller pieces blasting through the air. These shattered too, again and again, a cascading catastrophe, each member of this rapidly multiplying army heating up due to its tremendous velocity. The incredible energy of their motion was converted into light and heat within a few moments. It happened so suddenly that it was by all intents and purposes an explosion—the equivalent of a half-million tons of TNT detonating. Still dozens of kilometers above the ground, a huge shock wave from the explosion began sweeping downward. People in and around the city of Chelyabinsk were just getting their day started, the Sun barely risen at the local time of 9:20 a.m. on that winter day. The first warning they had of what was to come was a flash of light, brightening as it moved across the sky, leaving a thick plume of dust behind it. It flared as bright as the Sun within a second or two, pulsing with energy, moving silently across the sky nearly from horizon to horizon. 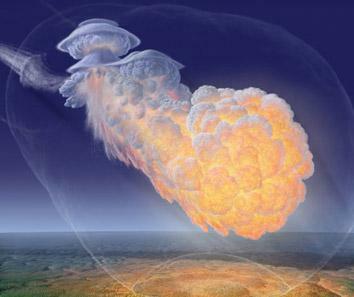 Artist impression of the Tunguska event of 1908. Click to embiggen. Artwork by Don Davis, used by permission. That silence was not to last. Moving at the speed of sound, it took the shock wave less than a minute to reach the ground. Like explosive thunder but hundreds of times more powerful, that wall of sound slammed down, shaking the ground, setting off car alarms, shattering windows, and causing structural damage to some buildings. Amazingly, no one was killed, but significantly more than a thousand people were injured by flying glass. Much of the original 12,000-ton asteroid burned up in the atmosphere. Countless thousands of tiny pieces rained down from the sky (to the future glee of meteorite collectors), with one chunk nearly a meter across and weighing half a ton punching a hole in a frozen lake nearby. Had that hit a house or a car … well. In the end, this event has been rated as the largest impact the Earth has suffered since the Tunguska explosion more than a century ago. Still, what became known as the Chelyabinsk impact, for all the damage it did, was from a chunk of rock no bigger than a house. Countless millions of such rocks orbit the Sun on paths that intersect the Earth’s. A million or more are far larger, the size of a football field or bigger, massive enough to do catastrophic damage should they hit us. We don’t have to go the way of the dinosaurs; we have a choice. Astronomy and space exploration can literally save the world. We just have to choose wisely.